The specs really speak for themselves. 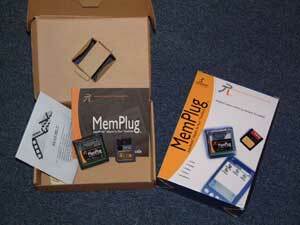 The MemPlug basically bridges the gap between the SmartMediaTM memory card, and your Visor handheld. You have lots of flexibility here since the MemPlug accepts pretty much any SmartMediaTM card on the market. If you already use SmartMediaTM cards, then you'll really appreciate the MemPlug. It acts as a true Springboard module and requires no external software to run. The only external software that you'll use is gMovie maker to create gMovie files from existing movies/animation files. The MemPlug requires no batteries of its own and runs directly off the Visor's power. The power consumption is small so you don't need to worry about the MemPlug sucking your batteries dry. 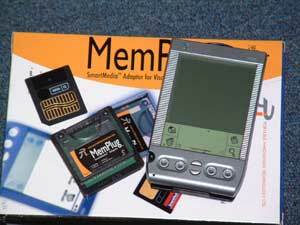 The MemPlug supports pretty much any 3.3V SmartMediaTM card on the market. It also has it's own Flash memory so that future updates to the module are possible.